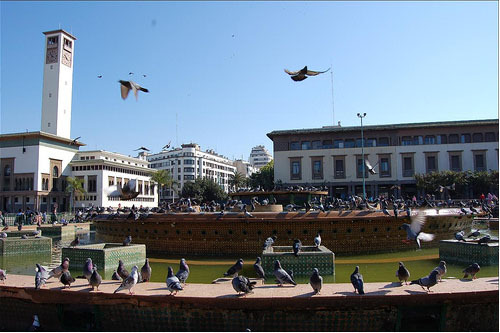 Casablanca began as a very small port town, but in 1912 it was designated to become the economic capital of Morocco by the General Lyautee, at the signing of the French Protectorate. 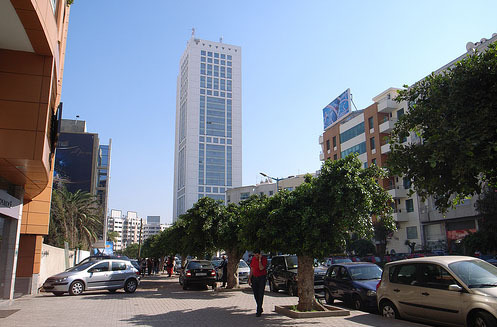 This launched Casablanca’s rapid ascent to become the economic heart of the country and one of the biggest cities in Africa and the Arab world. During the early 1900’s, Casablanca was a blank slate where some of Europe’s most respected architects built the city from the ground up. 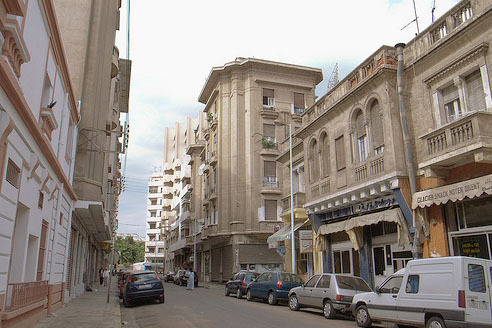 Casablanca has a spectacular collection of art deco, art moderne and art nouveau architecture dating from the Protectorate. Today, this fascinating city mixes stock traders with souk vendors, fashionistas with old women in traditional djellabah. 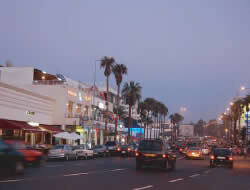 Casablanca is the embodiment of modern Morocco. 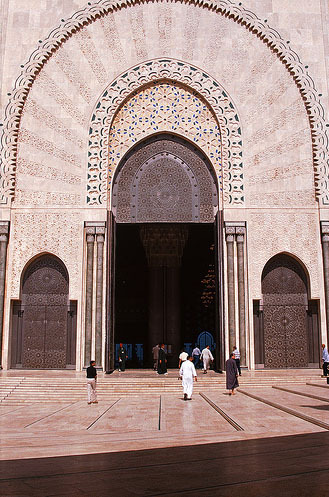 Built on the Atlantic Ocean, The Hassan II mosque is the tallest mosque in the world, in addition to being one of the most beautiful. 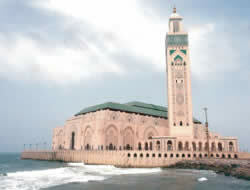 A project of Pharaonic proportions, ten thousand Moroccan artisans worked on this mosque, which opened in 1993. The interior is even more impressive than the exterior with an amount of detail in the work unheard of at this scale, with beautiful ceramic mosaics on the walls, luxurious marble and rugs on the floor, and beautifully carved wood ceilings. Easily one of the most impressive structures of the late twentieth century. 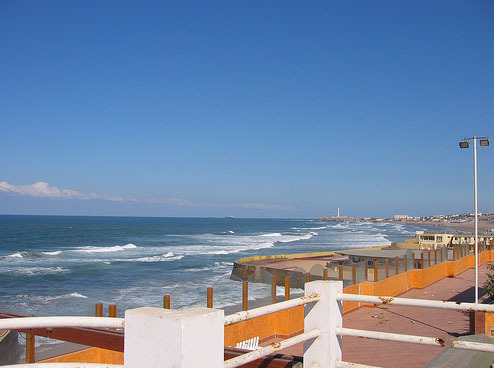 La Corniche is a pleasant and beautiful boardwalk on the Casablanca seashore. The fresh sea air and pleasant white buildings make a stroll along the Corniche a great passtime. 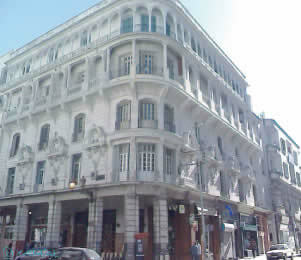 A popular destination for tourists and Casablancais alike, it has numerous restaurants, cafes and nightclubs. It is equally pleasant to visit during the day or at night. 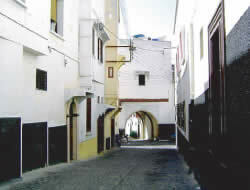 The new medina was built by the French in the 1930’s to accomodate the city’s fast growing population. What they created was an idealized French vision of the traditional Moroccan medina, blending Moroccan architecture with more modern styles, equipment and planning. An interesting architectural experiment, whose results are worth the detour. Impressive in its size, harmony and simplicity of design, the Sacre Coeur Cathedral is a great example of the more exiting projects undertaken during the art deco movement. The Arab League Park is a beautiful french style park which harmoniously blends the local flora. 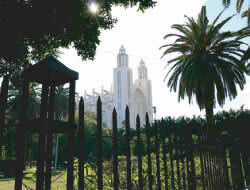 The park was built in 1930, the same year as the cathedral. Derb Ghallef is infamous in Morocco for its size, scope and scale. 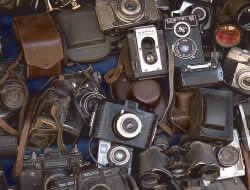 An informal and erratic market to the naked eye, Derb Ghallef is complex and suprisingly well run whose offering includes everything from used cameras and books to state of the art electronics. Worth a visit to see Moroccan-style, grey-market capitalism at its finest. While the original movie Casablanca was filmed in a Hollywood lot, you couldn’t tell by walking in to to this replica of the infamous bar owned by Humphrey Bogart’s character. The attention to detail is so impressive one might even say it’s more authentic than the movie. Rick’s Cafe lets you experience a romantic, Hollywood vision of 1930’s Morocco.